On a photo are crystals of Cordierite from Oriyarvi, Finland. Down: prismatic crystals of grey Cordierite are in a quartz-micas rock. Cordierite, or a dichroite is aluminum silicate. Glance (glitter, glare) glassy to fat (in a fracture). Transparent to translucent. Colors: at consideration along one ax of crystal bluish, along other rather yellow-grey (or greyish-yellow, gold); such phenomenon is named dichroism. A line is white. Fracture, break padman. Cleavage perfect absolute. Crystals (rhombic Crystal structure) are rare. Places of distribution: Bavarian Forest (Germany), Saxony (Germany), Sweden, Scotland. Cordierite is a grey or violet-blue dichroic mineral that consists of magnesium aluminium iron silicate in orthorhombic crystalline form and is found in metamorphic rocks. Formula: (Mg,Fe)2AL4Si5O18*nH2O Also called: dichroite, iolite. Etymology: named after Pierre L. A. Cordier (1777-1861), French geologist who described it. A mineral is adamantine, possesses hardly showing up cleavage. Can have the different colouring: yellow, chlorine, blue and other Be found either as massive accumulations of shallow crystalline grains, mica products of change often covered a raid or as the well developed crystals of shortly-prismatic type, rectangular in a section, and, finally, as twins with hexagonal contours. Transparent colourless differences with glass brilliance, bluish due to the presence of iron, more known under the name iolites, are highly valued. Possesses noticeable pleochroism: in three mutually perpendicular directions it is possible to look after yellow, inconspicuous-sky-blue and bluish (cyan)-violet-blue colouring. Cordierite is refractory. Under the action of acids changes partly. Feel like the second changes with formation of mica products. 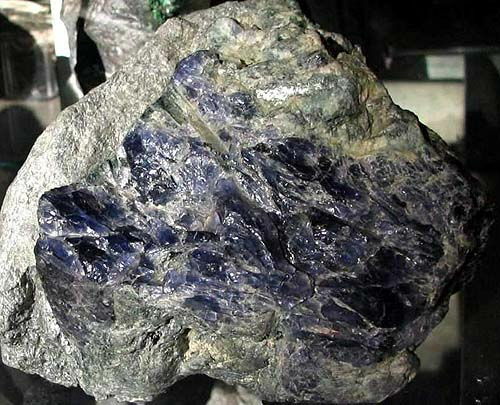 Cordierite appears mainly in aluminum-contain rocks, exposed to contact metamorphism; but main deposits from which Cordierite is obtained as jewels color stones are deposit over again. Semiprecious stone became a fame from Sri Lanka and Burma. Other countries, where кордиерит is widespread: Brazil, Madagascar, Germany, Finland and Norway. 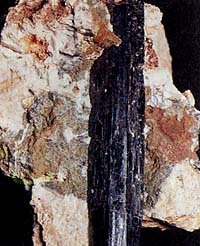 In Italy Cordierite as shallow crystals of mainly chlorine color comparatively widely widespread in many places: in Adamello (within the limits of areas there is Lombardy and Trentino), in Valsesiya (an area P'emont) and Val'-Kodera (an area is Lombardy). Using is in jeweller business. The crystals of Cordierite are usually exposed to the step cutting of rectangular or octagonal form. It is thus aimed to dispose foundation so that every time, when it turns athwart axes, stone seemed blue. Cordierite. Sassyk-Su, Murgabe, mountain ridge Muzkol, century Pamir, Tadjikistan, CIS. A photo: © A.A. Evseev.